together to compensate a little bit for this lack of features. What I came up with are "VObjects". Variable objects. purposes. The attributes support all the datatypes dbp can handle. Also a Variant Datatype I implemented. Attributes of a vo can be read via index, name or first/next. all the components of this system including filtering and sorting. Regarding the sorting: Not all aspects of the variant are tested yet. Variants values can be get and set via the default functions. VObjects can be filtered and sorted in lists. Equal - "=" Smaller - "<" Smaller/Equal - "<=", "=<" Unequal - "!=", "=!" Bigger - ">" Bigger/Equal - ">=", "=>" Exists - "?" "integer PosX >= 10" "float Rotation >= 3.5; float Rotation <= 10.5" "string Name = John" "integer Size => 10; byte flag != 3" "byte flag?" "float Rotation >= 3.5; float Rotation <= 10.5"
"integer Size => 10; byte flag != 3"
"asc Priority" "desc Difference; Distance asc"
PRINT vo; " var1:   '"; vo_get_string(vo, "var1"); "'    var2:   '"; vo_get_byte(vo, "var2"); "'    var3:   '"; vo_get_integer(vo, "var3"); "'"
vobject system. Well, at least as long as there are no changes made with the shared memory values. I will rework this feature and use a network connection instead of shared memory. I'm doing all the operations directly inside the memory ... so don't expect the use of types here. This turned out to be pretty efficiently and fast. The Text values for VObjects are stored outside of the object so I can have fixed values for the string values inside of the VObjects. Text values with the same Text share the same vot in memory. When strings are involved I'm not comparing the strings but the memory that holds them. 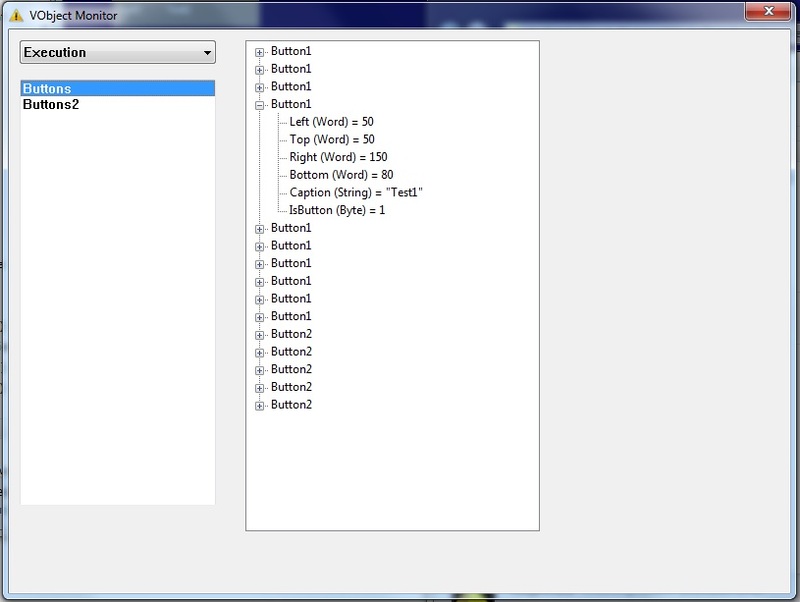 Simple start of a button-management for a gui. This isn't optimized but working! Runs with ~3000 FPS for me. PRINT "Done in "; time2; " ms." `Print commands are included in this time! `Create a list containing all vo objects with the attribute "IsResolution"
- No known issues atm. - Feature: Save/Load vo, vol, complete execution. - Feature: Parent/Child behaviour of vo obects. - Remove vos and vof objects from vol object. - More Power! More performance is always good. - Added several functions to set standard attribute of the different objects. - Fixed memory leak in filter process. - Fixed infinite loop in autofilter/sort process. - Fixed crash in deinit process. - Added several functions to set standard attribute of the different objects. - Fixed memory leak in filter process. - Fixed infinite loop in autofilter/sort process. - Fixed crash in deinit process. - 1.02 Download The monitor application doesn't seem to work with this anymore XD. However, as I said: I will rework this feature anyways. If you like what I did here I would appreciate a little donation . I'm still working on the List object ... resolved some ugly problems today XD. 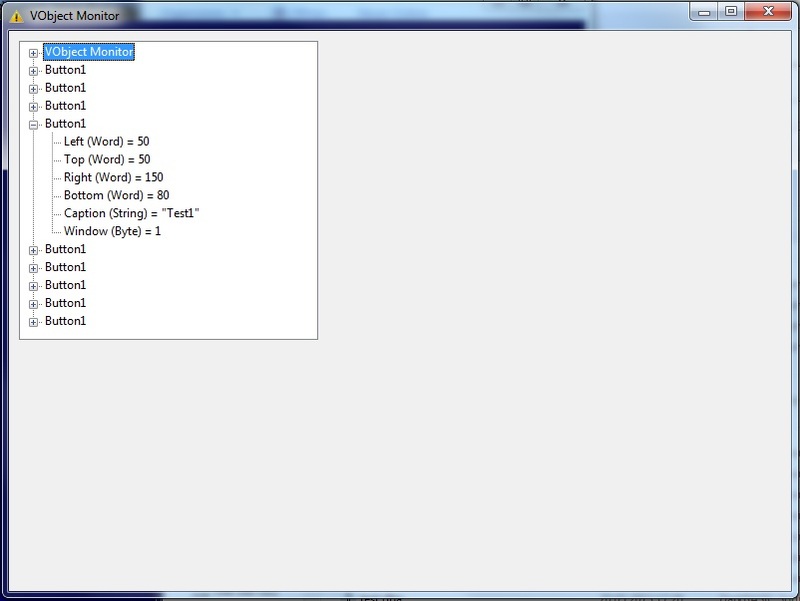 Also I implemented a possibility to catch simple commands. Now I can set the List Filter to '@All' to have it list all vobjects. I'm currently implementing the other datatypes into the List Filter. Then I had the idea to implement a possibility to also sort the list. Shouldn't be to hard to handle. Something like "asc var1;desc var2". -> This would sort the list by var1, and by var2 where var1 attributes have the same value. -> Every next level sorts the items of the same value from the above level. I'm not yet sure how I will do this XD ... but I bet there's an easy trick to get this working. Maybe a recursive function will do the trick ... so I can just sort one level at a time. However, I still have to make a performance analysis of the List Refreshing in combination with large amounts of vobjects. Also I need to change the behaviour of auto-refreshed lists XD. Currently they are refreshing every time a vobject is created. But I think I will rather set them in a "dirty" state and refresh them once if they are about to be used. Btw. : Did you run the code? Which results did you get? So basically, I create a vobject then I can assign various pairs of key-values to it? Or is it doing something else? Many years ago, before you joined the forums, someone made a precompiler for DB that allowed objects like you'd expect in OOP. I'm not sure whatever happened to it. Other than that ... no the basic purpose is to create objects with dynamic attributes. Or in other words attributes that aren't known on compile time. I reworked the Filter Parser and it's working out pretty good this time. Definitely an improvement. Quote: "Other than that ... no the basic purpose is to create objects with dynamic attributes. Or in other words attributes that aren't known on compile time." My immediate thought of using this is to build XML elements. If I was to ever expand my XML library to write files as well, this would be very handy. Actually I was thinking about parent and child behaviour. But if anything I will add it later. Here's a request for a feature - some way to save the entire list of VObjects and later load that file. This could be useful in games because the engine could manage every entity using your VObjects system. By being able to save and load this data, it would make it easy to create a saving / loading system, which could serve as a level format as well. With this system, I could parse through every entity and do a check to see if its object has been loaded. If not, I load the object. If the object is loaded, then the engine will proceed with whatever other code that object has. also - I downloaded and ran your code, works very well and the demo runs about 700 fps with about the same values/ms you have. I haven't tried to use it in my engine yet but it seems to be working very well. The List Object now supports all the dbp datatypes for List Filtering (except string). "integer %test = 1000000000" " double integer %test=3" "FLOAT %test = 4.6" " dword %test = 4" "double FLOAT %test =4.2; DOUBLEINTEGER %test= 10" "	integer %test = 1" "	word %test = 3" "	dword %test=3"
" dword 	%test = 4"
"double FLOAT %test =4.2; DOUBLEINTEGER %test= 10"
"		integer %test = 1"
"				word %test = 3"
In the end the trick was pretty lame XD. Well I bet there are still some statements that can crash the process XD. I'm using "VAL" to convert the Filter Value from string to the various different datatypes, but apparently "VAL" only returns a float. Because then it would fail for double float, double integer, maybe even dword. Basically every value exceeding the range of a float. "double integer %test = 2147483648000000"
I guess that's good enough for now XD. However I can filter them in a list in 62ms. That's not bad, but could still need some more performance. So for now it's a bad idea to repeatedly create and delete objects. EDIT3: I attached the new source code with the new filter parser. Autorefresh doesn't seem to work anymore right now XD. I'm not quite sure though XD. Notice: I definitely will rework the filter parser a bit more. I want to merge the process into one function so I need to do as few string functions as possible. Regarding the VObject creation: I guess I could lower the time it takes to create them if I implement the buffer I was talking about earlier. Currently I'm increasing the objects every time I append a value. So the object is recreated in memory in a different size. For VObjects -> Every time an attribute is added. For VObject Lists -> Every time the Filter is changed or an vobject is added to the list. From 10000 objects in ~16 seconds to 10000 in ~3.8 seconds. Quote: "The List Object now supports all the dbp datatypes for List Filtering (except string)." For storing strings, can you create the string but instead of hashing that as the value, hash the pointer to the string? In some situations that's possible but for functions I call directly with a String I need another solution. I'm actually more comfortable with the memory comparison. Because if anything happens with my Text System and the Strings aren't reused how they should the pointer method would fail immediately, the memory comparison would still work. I updated the code some more and I could get a lot more performance this time . 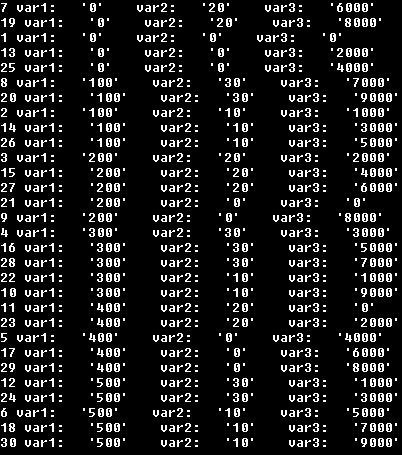 I'm now able to create 10000 VObjects in ~86 ms, one attribute each, and list them with "@All" in ~8 ms. If I filter them by one attribute ( "integer %test = 1" ) it takes ~45 ms. I assumed that the code crashes if I compare memory that isn't properly allocated by my program. So to make sure I only compare the memory I allocated I always needed two sizes when comparing string in memory to make sure the size I'm comparing doesn't exceed the memory sizes. But actually I noticed it doesn't seem to matter which memory I'm comparing. It seems like I just shouldn't read or write without checking first. They start with a size of 256 byte each and have plenty of space for attributes. If the size is exceeded it's increased by 64 bytes. I can now create 1.000.000 VObjects, with one integer attribute each, in ~10 seconds. I don't know if this is fast enough XD. I'm gonna do the same to the VObject List now. The VObject List buffer is working. I'm not sure yet how to configure it, but I guess I will let the lists have their own buffer values. Some lists are meant to hold many objects while others only hold a few. - Create 1.000.000 VObjects, one integer attribute each - ~5,7 seconds. - Filter them in a List - ~917 ms.
- Cycle through List via getfirst, getnext - 96 ms.
- Create 1.500 VObjects, one integer attribute each - 6 ms.
- Filter them in a List - 6 ms.
- Cycle through List via getfirst, getnext - 0 ms.
- Create - 54 ms.
- Filter - 11 ms.
- Cycle - 1 ms. String filtering is working, but far from perfect XD. I got a nasty problem I just can't figure out. Well, you shouldn't filter by string anyways. I reworked big parts of my string handling and now the string filtering is working perfect. And it works pretty fast too. Next thing I'm gonna do is clean everything up and fix my datatypes. I used many integers but that was actually a bad choice in many cases XD. I should have paid attention to it earlier . Yesterday I restarted the project and began to rework it from scratch XD ... there where to many things I haven't really thought of early enough. This time I'll create more different objects in memory and just link them. Before vof, vos and vol would have been combined, which leads to many calculations and loop-countings when searching for specific ptr adresses inside an object and that of course decreases the performance. If I split up the objects like this I also have less problems when changing values ( of attributes for example ). However, probably the most important thing is: This time I'll choose fitting datatypes right from the start XD. For example: The Attr Count of a vo was an integer value before, now it's a word value, which means a vo can have up to 65.535 attributes now, instead of 2.147.483.647 XD. I even doubt that anybody would ever use 65.535 attributes XD. Well, actually you have to substract 1 everywhere because my indexes start with 1 now. I already finished my work on vot and I'm working on vo right now. Currently I can create 10.000 vot objects in 19 ms. Creating 1.000.000 vo objects, one integer attribute each, takes ~3,5s. I was thinking about a variant datatype inside of my system. But actually I'm not sure how helpful that would be :/. Creating 10.000 vo objects, 8 attributes each ( every datatype ) in 224 ms. I actually implemented the variant now. Wasn't as much work as I thought. The function to set the value will probably look similar. Another thing is that variants will probably never be very performant XD, but that's quite typical. For variants the value parameters will be checked from left to right. The first parameter <> "", 0 or 0.0 decides the datatype of the variant. So if two parameters are used the secound will be ignored. When retrieving the value from a variant attribute the normal functions are used. If the datatype doesn't match a NULL value will silently be given back. Now I could probably implement a setting to have the variant return for example an existing float value if a double float value was requested. But actually I think that's not how it should work XD. The variants should provide the possibility to store different datatypes but the user should still keep in mind what is in there. I will provide a functions to get the variant datatype. The code is much cleaner and more compact this time . I'm gonna double-check everything now and comment and stuff. Then I will add the funtions to set attribute values. After that I will start to work on the vol, vof and vos objects for the Lists. The vot object is pretty stable as far as I can tell, so this time I actually think I can filter by comparing the linked vot objects, which will probably give the list-filtering a significant boost. So I guess it won't be a problem to have lists autoupdate all the time, although I will probably still use a dirty-flag to signalize the system to update it as soon as it is used. I got the filtering running again. All datatypes are supported even the variants are working. Notice: The "%" before an attribute name isn't needed anymore. "integer width = 100" "string text != hello" "double integer id < 10000; byte state = 1" "float rotation >= 6.7"
"double integer id < 10000; byte state = 1"
If the value provided in the filter statement is a string value the vo object will be checked for an attribute with that name. If the vo object doesn't have an attribute of that name it's treated as a string value.
" integer        state =         2"
The vol ( VObject List ) object is really stable this time. A list can have up to 254 filter statements and 254 sorter statements. Sorting isn't working yet, that's the next thing I'm gonna do. Btw. : I forgot to create the functions to set attribute values XD. So they aren't included this time. - Updated the first post, removed some of the outdated information and pictures. - Removed all old versions of the snippet. Omg I thought the sorting would be easier to get done. I don't know if I can get this working. The above filter would compare attribute "width" with attribute "height". If attribute height isn't existing within the object it won't be listed. I just now discovered the excellent array sorting by IanM . And I actually got a concept for my multi-dimensional sorting feature right now. The sorting probably was the hardest part until now XD. But I got it working and actually I'm pretty glad how it worked out. In the end I could resolve all my problems with a recursive sort algorithm. The key right now is to only sort the entries in the next sort-level if there are identical values within the values of the current sort-level. Actually it's pretty easy if I think about it right now XD. The sorting is created in a way to support up to 254 sort-levels, but actually I doubt that anybody will ever use them all XD. You can sort via all datatypes, including strings and my variants. "var1 asc" "Width desc" "desc Width; Height asc; desc Depth"
"desc Width; Height asc; desc Depth"
I haven't really tested everything regarding variants yet. PRINT "Sorted vol in "; time2; " ms."
Sorting 10.000 vo objects by 3 attributes ~44 ms.
- Added functions to set attribute values. - Standard functions are also working for variants. - Autosort and Autorefresh for VObject List are working now. - Updated the first post to resemble latest version. EDIT: I'm gonna call the latest version 1.0. Ah well, I just remembered there's still the saving and loading I could implement. Saving single vo or complete vol with filters, sorters and vo list. Oh and there is another potential feature: Parent/Child behaviour. I'll see what I can do about that stuff. I got a nice idea for the import/export feature. I will design it for multiple export/import types right from the start and create a shared memory export. Just like the standard export with files the objects are transformed into a recreatable form. But instead of writing them to a file I will write them to a chunk of shared memory ( the commands are even similar ). When finished the program will go into a mini-loop waiting for another process to pick up the shared data. After the processing of the data this other program writes a value into the first few bytes of the shared memory to signalize the main program to continue. That way I could create an external tool to monitor the objects. I guess I could even let the monitor app "request" a memory share via a value in the memory. So you could start your application and if anything isn't working as it should you could just start the monitor app and have it request and list all objects automatically. I think that sounds uber-nice . I focused my work on the monitor application for now. I can now request and list vo, voa and vot objects in an external monitor app. The gui doesn't have any functionality yet. Also I removed a bug where the creation of lists could lead to a crash. The source code is mostly the same as the normal one, but has some additional functions. This is the compiled version of the monitor source code. The gui of the monitor application actually works already. I haven't fully tested everything but it seems to work well. Notice: The monitor application only works with code compiled from version 1.01 and above. I took kind of a forced break from development XD. functionality I find missing while I'm actively using it. Also I want to ensure that the "get_nth"-functionality is always working how the user is/I am expecting. lists will crash the process, because the shared buffer isn't big enough. shared memory, because this will open the door to network-monitoring of applications. I have Servers and other things in mind here. For now this feature doesn't have a high priority for me in development. It's a nice to have. When repeatedly filtering vobject lists they got bigger and bigger XD. This is actually a major bug, so I will probably release an updated version today. - Fixed an error where autofilter and autosort could lead to an infinite loop, crashing the application. I think I just recently "implemented" this error XD, so the released version 1.01 shouldn't be affected by this. - Fixed the bug that crashed the deinit process, which I couldn't find for so long. Turns out I'm an idiot and read a dword value from memory instead of a byte value in the voa delete process. - Added several functions to set standard attributes of the different objects. - Fixed memory leak iin filter process. The monitor application doesn't seem to work with this anymore. To be honest I haven't looked into it for quite some time now and I'm not exactly sure why doesn't work anymore XD. But I want to rework this feature anyways so I don't really care right now XD. I'll probably target the Save/Load feature next. However, I would like to know: Does anybody actually use/test this? I know there are quite some functions that can be confusing at first and I don't provide a help file at all. Do the examples in the first post help with that? A little feedback would help. I decided to implement a new "VObject Save Load ( vosl )" object in the code. The object will provide the functionality to save and load. - Save/Load lists of VObject ( vo ) Names. This will include all attributes of the listed vobjects. - Save/Load lists of VObject List ( vol ) Names and their VObjects ( vo ). This will include all vobjects listed in any of the vobject lists in the namelist. This will include all vobject lists and all vobjects the system has loaded to that point. This will be much easier to handle as a full object rather than some single functions. And I can use links between the objects in memory much easier this way. I already started my work on the save/load function. But I'm thinking about using the same operations for network functions as well as network monitoring. The idea is to have a central streaming that can stream performant commands to players as well as stream objects or whole lists to files, another application or a server. So the server would be able to send a VObject List ( vol ) containing the players as VObjects ( vo ) or something like that. For now I paused my work on it and did some other stuff with the object system. entries ( vo ) in a vol. I implemented an option into the object system that allows attributes that get set but don't exist to be created with the given value. Also I added some more function variants for string handling to be able to handle them more intuitive. I was in hospital for the last 1,5 weeks XD ... so I couldn't do anything in that time. But I will probably continue with this in the next few days.